Unless you've been subletting an Internet-proof bunker, you've probably heard by now that Instagram is about to make a big change. Taking a page out of Facebook's, uh, book, it'll soon employ an algorithm to optimize your photo feed; instead of a stack of posts presented in reverse-chronological order, you'll see the stuff you care about most first. Of course, people tend to be averse to change, and chaos promptly ensued after the announcement. 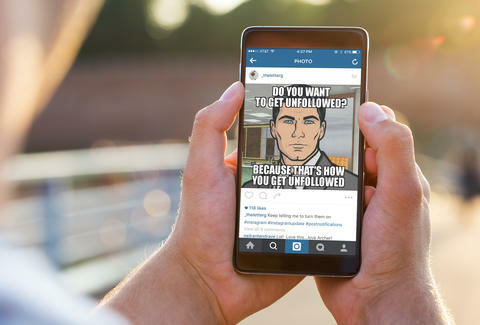 Maybe you even foolishly fell for that misguided "Turn on Notifications" meme that made the rounds as users scrambled to hang on to their precious Insta-popularity. But there's really no reason to freak out right now -- not only because the change probably won't go down for a few more months, but because when it does, it's going to be a good thing. Unless you're a garbage-person celebrity, in which case you might be screwed. There's no shortage of bad Instagrammers out there, including a fair share of celebrities who've amassed millions of followers simply because they’re famous. But it’s safe to assume that even Sinbad and Jennifer Lawrence's biggest fans probably scroll past their lame selfies. Now, growing an Instagram audience and being seen on the platform will depend on whether you can get to the top of someone's feed -- and that depends on getting that person to like, comment, or hover over your posts rather than simply follow you. Celebrities and #influencers will be forced to up their content game or be doomed to Insta-irrelevance. The end result? A better, more interesting Instagram. That's good, right? For every person we actively enjoy following, there's another we're begrudgingly following out of a perceived obligation -- random college classmates, your Aunt Pam, that vaguely creepy dude from that networking event. Sometimes following someone back is just the polite thing to do, even if their posts are boring as hell. Pretty soon you'll be free to flatter anyone and everyone with a follow, without clogging your feed with other people's kids and your aunt's out-of-focus food pics. All you need to do is steer clear of liking, commenting, or hovering over what they post and their stuff will be relegated to the bottom. In addition to the flash-in-the-pan fame that comes with amassing a huge number of Instagram followers, "influencers" can also make serious money shilling products most of us have never heard of. However, once the algorithm switches how and when you’re seeing the people you follow, it's going to be tough to measure exactly how many eyeballs will actually see Hilary Duff promoting some weird tea or Nick Cannon pretending to be super pumped about teeth whitener. It may very well change how much money brands are willing to shell out, and subsequently, how many influencers are willing to shill. That's bad news for brands, but ultimately means less obnoxious "native" marketing for us to wade through. There are certain ways for egregiously insecure Instagrammers to find out when someone unfollows them. Now you can spare yourself the shame of being awkwardly called out and just ignore them instead, letting their subpar posts settle at the bottom of your feed with the rest of the chaff you never have time to scroll through. Joe McGauley is a senior writer for Thrillist. Watch out for his poorly lit still lifes and half-baked captions: @jwmcgauley.